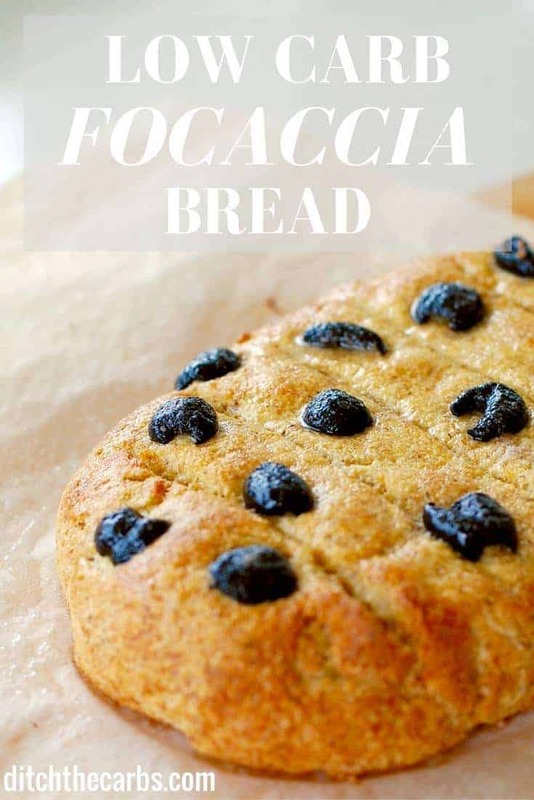 Wheat free, gluten free, sugar free low carb focaccia bread. I don’t usually look for a bread substitute as that is the thing we are all trying to give up, but if you do fancy one, or need to take something to a barbecue, then it’s good to have an alternative available. And don’t go for gluten free breads as they are so processed, then fortified, high in other grains and incredibly high in carbohydrates. Gluten free products are a multi billion dollar industry which is incredibly unhealthy. Go grain free for a cheaper, better way to eat (I’m guessing I won’t be getting and big GF company endorsements now huh?). Add plenty of olives, rosemary and salt on top. 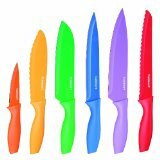 Slice thinly, or even toast. NOTE : The nutrition panel is for the ENTIRE low carb focaccia bread. It’s up to you how many slices you cut it into or if you use it as a pizza base. Low carb focaccia bread can easily be made as a garlic bread too. Ensure before baking you have shaped the focaccia to be flat and cut little slices half way through the dough. This helps it cook evenly throughout. Place the coconut flour, psyllium husks, baking powder and salt into a large mixing bowl and stir until combined. Add the eggs and mix. The mixture will be a very firm 'play-dough' like consistency so don't work it too hard at this point. Add the cup of boiling water and mix until thoroughly combined. Form into a focaccia shape and place on a baking tray lined with baking paper. Using a sharp knife, make diagonal cuts through the dough, sprinkle with plenty of salt, rosemary and place olives on top of the dough. Bake at 180C for 25-30 minutes. It is cooked when the centre is no longer 'spongy'. Serve hot with butter, cold with cheese, avocado slices, tomatoes, labna, etc. * To ensure you avoid any 'eggy' taste, add plenty of flavours such as rosemary, garlic, salt etc. * Psyllium husk 100% fibre and once added to water, swell and thicken. This property is used to thicken foods, added to gluten-free baking where it binds moisture and help make breads less crumbly, and as a laxative. Always drink plenty of fluids when taking psyllium, as the husks will swell and absorb liquids from your gut as it transits through. Oh dear …psyllium and coconut. I agree.Psyllium is just *yuck*! I do not need or want any of that kind of fiber in my diet. I have gone mostly carnivore and I feel much better without bulky fiber. No eggs in this bread? And no leavening of any sort??? I’ll take a pass on this one, thanks. Oops, I can’t read this font very well. Looks wow. i’m still new to the keto so carbs that are fiber don’t count as carbs? put the remaining slices in the freezer to be toasted for breakfast! Great website! I am going to try this bread tonight – hoping it does not have a coconut taste as my hubster hates the taste. I have not found coconut flour here, so I use a coffee grinder to mill the coconut into a flour. Will try and disguise it with salt and feta. I’ve tried this twice and both times it stays really doughy in the centre and just won’t cook! Any suggestions? Did you make the dough flat enough and cut slices half way through? This both replicates a regular focaccia bread and allows the heat to go through the dough. The oven needs to be hot enough too. If this ever happens again once it is cooked, you can also slice through the focaccia and lay each slice on the baking tray and cook again on both sides. It turns the slices into ‘biscotti-like’ pieces which are lovely with butter. Hi there, my bread got really stiff and chewy while cooling off, is that normal? Not quite as fluffy as I would like to be. Was it because of my psyllium brand that made so? Thanks ahead for your reply! I just tried this for the first time and I changed up the method a bit. Using my kitchen Aid mixer with the whisk attachment, whisked the eggs until they were fluffy. While they were getting fluffy, I added 1 tsp of Italian seasoning, 1 tsp of garlic powder, 1 tsp of dried thyme and dried rosemary. This ensured there would be no eggy flavor. I then added the sifted dry ingredients, mixed for another 2 minutes while adding the hot water. I never experienced a play-doh consistency. I put the dough on parchment paper and used a chop stick to poke holes all over it. I cooked it on one side for the full 30 minutes, then I flipped it over and cooked for another 15 minutes. What I got was a light, airy bread. I was able to have my first grilled cheese sandwich since I started my low carb journey. That is wonderful information. I am excited to try your method. I miss grilled cheese too. Ok so just to confirm…is the above nutritional value of 16 net carbs (total carbs -fiber)per serving (a 4th) or for the entire recipe? Great question. The entire recipe is 58g total carbs minus 41.6g fibre = 16.4g net carbs for the entire loaf. This is a great bread substitute, but since I hardly ever eat bread I always freeze my low carb bread for when I feel like having some. Would this bread be alright to defrost in the microwave? (In slices, not the whole loaf). Yes you could defrost it in the microwave but better still, I would freeze it in slices and each slice would only take a few minutes on the kitchen bench to defrost naturally. Oh my word! Just made this and had to stop myself from eating the whole loaf. I maade this amazing foccacia bread today for the first time. I can see it being a favourite for me when I am needing a “bread” fix. Can’t wait to try it with soup. Thank you. Thank you Sally, this is a lovely comment to leave me. You can also roll it thin into bread sticks or make garlic bread with it. Yes coconut bread can taste eggy of you don’t add enough flavourings. I make my focaccia bread with lots of salt and lots of garlic sometimes, then I even add garlic butter too. You can’t replace the eggs with chia or flax in this recipe because it is too egg based. 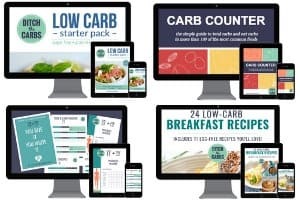 I do have another basic skillet bread recipe but unfortunately it is in my Low carb starter pack. I’ll try and develop some more bread recipes. I’ve been a bit slack as I don’t really care for bread anymore but I’ll try and make some more for you 🙂 Have you tried my crackers – Fathead and wheat free ones. Would it be okay to substitute oat fiber for the psyllium fiber? I’ve never used oat fibre so I apologise, but I can’t really advise on the substitution. Has anyone else here used it? sorry to ask it again, but for me it is still not clear….did you use the psyllium husk powder? in the link the picture shows the powder, but in your comment you say it is not the powered one…. Hi Timea, I have added a picture below the recipe to show you exactly what I use. I”m right in the middle of making it and I only have powder! Will that work? How much? How much powder would you use? I would imagine it would be less than if using the whole husks…. I love this recipe! I actually roll it out thinly for a pizza crust base. Between two pieces of parchment paper and bake at the listed temperature. 30 minutes and flipping halfway. I like it better than the fathead crust as it provides more fiber. The taste and texture is great! I also cut it into pieces for sandwiches this way. Makes an excellent grilled cheese! Brillaint suggestion Erika. I think I’ll try that next time. I love the sandwich idea too. I could even bake them slowly and dry them to a crisp for crackers. Do you think I could replace the coconut flour with soya flour Or almond flour? Can you substitute almond flour for the coconut flour? You could but you would have to add more. Coconut flour is incredibly absorbent so you require so little. Hi Libby, I tried making this bread and it came out really dark, both inside and out and nothing like the picture :-(. Do you know what could have gone wrong? It wasn’t overcooked. Gosh I’ve never heard of that, any tips anyone? Some types of psyllium husks makes the bread turn purple. I have no idea why but I’ve read about it on several sites. Sure, I add all manner of things – sundried tomatoes, olives, feta, garlic…. Hi there just had a question how many calories are there in every 100g? Some of my older recipes don’t have nutrition panels yet. I am trying to slowly go through them and update them, but in the meantime you can calculate it through chronometer.com (MyFitnessPal has too many inaccuracies I have found). Would this be ok in the freezer? Thinking making a couple then slicing and freezing so can just pull a few out at a time? Absolutely stunning recipe! Very quick to make and the focaccia comes out beautifully every time. Thanks so much for sharing 🙂 I added 1/2tsp garlic powder when making the bread and it was divine! What a great suggestion Lindy, thanks for your lovely idea and comment. I am allergic to psyllium in any form, is there something I can use as a replacement ? Sorry no not really for this recipe as such a large quantity is required. I used a dessert spoonful of flax meal instead of the Psyllium husk, turned out lovely. I’m a newbie to your site. 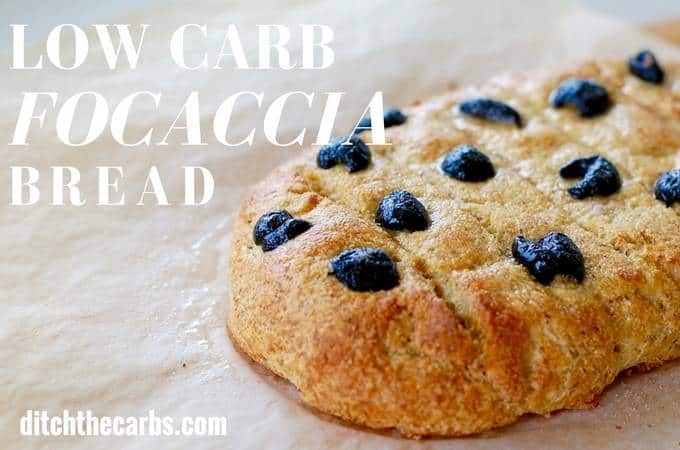 I have been looking for a no carb / low carb bread to try and came across your focaccia bread. I tried it this morning and this was absolutely delicious!! I’m T2 diabetic so this recipe is definitely a keeper for me. Thanks again!!! First of all, thank you for sharing your amazing recipes with us! Quick question: do you know how many calories this bread has? Hi Ana, This is one of my first recipes I posted. I need to go back and include the nutrition panels on my older work. You can calculate it on MyFitnessPal until then. I’m so glad you are enjoying my recipes. Thanks, Libby. This may have been said somewhere on your site but I missed it so I was wondering if all your recipes with psyllium are the whole husks or can ground psyllium be used. I’ve never used the whole husks and I just bought a lg bag of ground because I went through smaller amounts too fast so I can’t afford not to use it. I’m on a small fixed income. If you did use the whole husks is there a way to use ground psyllium in the recipe? The bread does look very good! I use psyllium husk , I have never seen the seeds but a quick google search tells me you can put them in you coffee or spice mill, or blender. I have never tried this and don’t know the results. Let me know how you get on. Libby. I guess my question wasn’t clear but your answer sounds like you use ground or powdered psyllium. I can’t tell from the picture but if you don’t have to grind it I’m guessing it’s already in powder form. Thank you. It is ground, definitely not the white powdered psyllium. Click here to see which product I use. Looks delicious, I cant believe how firm and moist it appears…does not look like you skimped out on taste at all! There are plenty of wheat free breads on the internet but after trial and error, I came up with this one. I add lots of salt and rosemary on top of the bread to take away the slight hint of coconut taste from the coconut flour. I don’t like the gluten free breads as they are just so processed and usually high in rice flour, tapioca starch etc so high in carbs. This one is only 4.5g carbs for the entire loaf and so packed with fibre for those who are concerned once they give up their wholegrain breads.